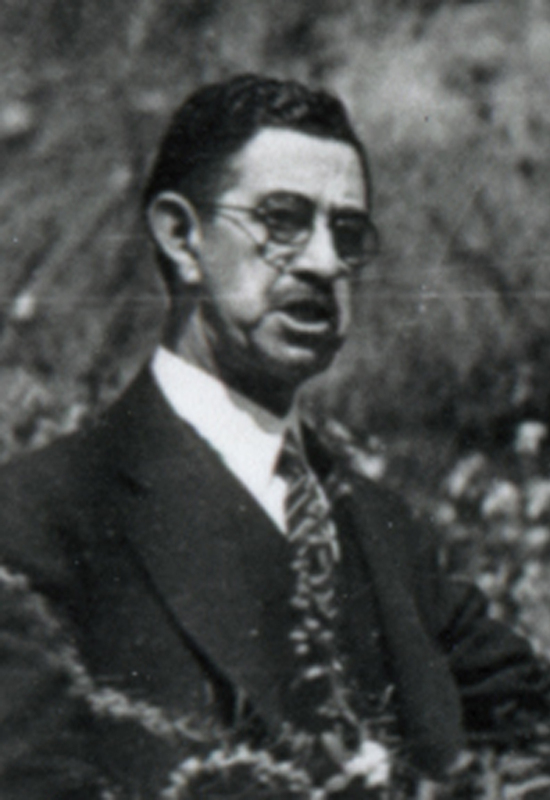 Adolfo G. Rivera was the chief architect of the original dedication of the Oak of the Golden Dream in Placerita Canyon on March 9, 1930, the 88th anniversary of the gold discovery by Francisco Lopez. It was Adolfo who determined which tree would be associated with the legend of Lopez's golden dream, on the word of relatives of a Lopez descendant who pointed it out to them 70 years after the fact. This is a piece of Rivera's correspondence relating to the March 1930 dedication ceremony on behalf of the La Mesa Club, which was one of the organizations to host the event. The others were Ramona Parlor No. 109 of the Native Sons of the Golden West (which Rivera also represented), the Kiwanis Club and Chamber of Commerce of Newhall-Saugus. Local historian and then-justice of the peace A.B. Perkins represented the latter two. 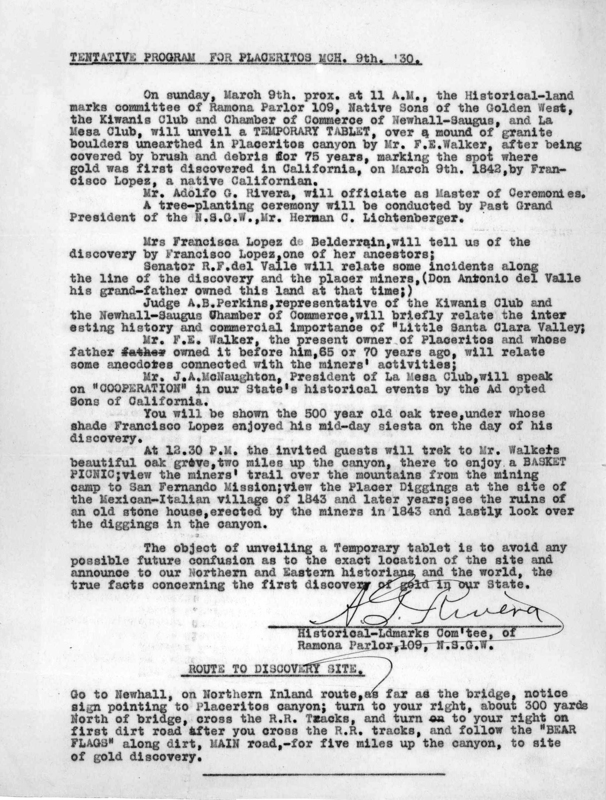 A digital copy of this document comes to us from Tom and Mary Salter; Mary is daughter to Tommy Walker and granddaughter to Frank Walker. The latter was the 1930 owner of the Lopez discovery site. Tentative Program for Placeritos Mch. 9th. '30. On Sunday, March 9th. prox. at 11 A.M., the Historical-landmarks committee of Ramona Parlor 109, Native Sons of the Golden West, the Kiwanis Club and Chamber of Commerce of Newhall-Saugus, and La Mesa Club, will unveil a temporary tablet, over a mound of granite boulders unearthed in Placeritos canyon by Mr. F.E. Walker, after being covered by brush and debris for 75 years, marking the spot where gold was first discovered in California, on March 9th. 1842, by Francisco Lopez, a native Californian. Mr. Adolfo G. Rivera, will officiate as Master of Ceremonies. A tree-planting ceremony will be conducted by Past Grand President of the N.S.G.W., Mr. Herman C. Lichtenberger. Mr. J.A. McNaughton, President of La Mesa Club, will speak on "cooperation" in our State's historical events by the Adopted Sons of California. You will be shown the 500 year old oak tree, under whose shade Francisco Lopez enjoyed his mid-day siesta on the day of his discovery. At 12.30 P.M. the invited guests will trek to Mr. Walker's beautiful oak grove, two miles up the canyon, there to enjoy a basket picnic; view the miners' trail over the mountains from the mining camp to San Fernando Mission; view the Placer Diggings at the site of the Mexican-Italian village of 1843 and later years; see the ruins of the old stone house, erected by the miners in 1843 and lastly look over the diggings in the canyon. The object of unveiling a temporary tablet is to avoid any possible future confusion as to the exact location of the site and announce to our Northern and Eastern historians and the world, the true facts concerning the first discovery of gold in our State. Go to Newhall, on Northern Inland route, as far as the bridge, notice sign pointing to Placeritos canyon; turn to your right, about 300 yards North of bridge, cross the R.R. Tracks, and turn to your right on first dirt road after you cross the R.R. tracks, and follow the "Bear Flags" along dirt, main road, for five miles up the canyon, to site of gold discovery. LW2575b: 19200 dpi jpeg from smaller jpeg | Online image only.